Since 1960, a total of seven species of monkey malaria have been reported as transmissible to man by mosquito bite: Plasmodium cynomolgi, Plasmodium brasilianum, Plasmodium eylesi, Plasmodium knowlesi, Plasmodium inui, Plasmodium schwetzi and Plasmodium simium. With the exception of P. knowlesi, none of the other species has been found to infect humans in nature. In this report, it is described the first known case of a naturally acquired P. cynomolgi malaria in humans. The patient was a 39-year-old woman from a malaria-free area with no previous history of malaria or travel to endemic areas. Initially, malaria was diagnosed and identified as Plasmodium malariae/P. knowlesi by microscopy in the Terengganu State Health Department. Thick and thin blood films stained with 10% Giemsa were performed for microscopy examination. Molecular species identification was performed at the Institute for Medical Research (IMR, Malaysia) and in the Malaria & Emerging Parasitic Diseases Laboratory (MAPELAB, Spain) using different nested PCR methods. Microscopic re-examination in the IMR showed characteristics of Plasmodium vivax and was confirmed by a nested PCR assay developed by Snounou et al. Instead, a different PCR assay plus sequencing performed at the MAPELAB confirmed that the patient was infected with P. cynomolgi and not with P. vivax. This is the first report of human P. cynomolgi infection acquired in a natural way, but there might be more undiagnosed or misdiagnosed cases, since P. cynomolgi is morphologically indistinguishable from P. vivax, and one of the most used PCR methods for malaria infection detection may identify a P. cynomolgi infection as P. vivax. Simian Plasmodium species may routinely infect humans in Southeast Asia. New diagnostic methods are necessary to distinguish between the human and monkey malaria species. Further epidemiological studies, incriminating also the mosquito vector(s), must be performed to know the relevance of cynomolgi malaria and its implication on human public health and in the control of human malaria. The zoonotic malaria cannot be ignored in view of increasing interactions between man and wild animals in the process of urbanization. It has been asked whether animal malaria could be considered as true zoonoses. It has been known for some time that malaria of some non-human primates may infect man . The infectivity of the simian malaria parasites in humans through anopheline mosquitoes has been demonstrated experimentally [2, 3], although natural transmission of a non-human Plasmodium species to humans was, until recently, thought to be rare . In 1965, the first case of a naturally acquired Plasmodium knowlesi infection was described , but it was not until 2004 when Singh et al. identified 120 (57.7%) individuals with malaria as single or mixed Plasmodium knowlesi infections, that simian malaria started to be considered as a concern for human public health. The absence of confirmed naturally acquired infections of other simian species of Plasmodium should not discourage consideration and investigation of them as zoonosis . Since 1960, a total of seven species of monkey malaria have been reported as transmissible to man by mosquito bite: Plasmodium cynomolgi[8–10], Plasmodium brasilianum, Plasmodium eylesi, Plasmodium knowlesi[2, 12], Plasmodium inui, Plasmodium schwetzi, and Plasmodium simium. Plasmodium cynomolgi, P. knowlesi, P. inui and P. eylesi are distributed in Asia, P. brasilianum and P. simium in the New World, while P. schwetzi is found in Africa . With the exception of P. knowlesi, none of the other species has been found to infect humans in nature. Natural P. knowlesi infection may progress as a self-limiting malaria with spontaneous cure , although generally the presentation progresses as moderate or can be severe [4, 16–19], requiring anti-malarial therapy [20–24]. The striking feature of induced cynomolgi malaria infections in man was the high degree of clinical manifestations observed in relation to the low level of parasitaemia . Clinical symptoms consisted of cephalgia, anorexia, myalgia, and nausea, in that order. The symptoms were usually present only during febrile episodes, were of moderate severity, and easily controlled by simple medications. The most prominent physical findings were splenomegaly and hepatomegaly . Plasmodium cynomolgi was first described by Mayer in 1907 in Germany in Macaca cynomolgus (= Macaca fascicularis) imported from Java . The morphological features of P. cynomolgi, by microscopy, are almost identical to that of Plasmodium vivax. The host red blood cell enlarges as the trophozoite grows, accompanied by prominence of Schüffner’s stippling and pigmentations in mature trophozoites. The cytoplasm becomes amoeboid and pigments in small granules with yellowish brown in colour are scattered throughout the cytoplasm. The asexual cycle is completed in 48 hours. The prepatent periods range from seven to 16 days with a mean of 9.8 days. Similarly to P. vivax, P. cynomolgi presents hypnozoites, which can initiate relapses . In this report, the first known case of naturally acquired P. cynomolgi malaria in humans is described. The patient was a 39-year-old Malay woman from the east coast of Peninsular Malaysia (Hulu Terengganu) with no previous history of malaria and an uneventful medical history. She lives in a modern housing area and behind her house there is a small, forested area with occasional sightings of long-tailed macaques. She works as a government nurse in a malaria-free area. She experienced episodes of mild to moderate 24-hour cycles of morning fevers since 10 January, 2011 with chills and rigor, cough and cold. Four days prior, she visited her mother’s house, in a non-endemic malaria area (6–9 January, 2011) and did not travel to any other malaria-endemic areas. The symptoms were non-specific and mimicked a flu-like syndrome. She took two days of medical leave (13, 14 January) without seeking hospital treatment. She felt more ill and was still febrile after two weeks and sought treatment at the Terengganu State Health Department. She was admitted to hospital on 20 January. A series of blood films for malaria parasites were taken and screened by microscopy and an initial diagnosis of Plasmodium malariae/P. knowlesi was concluded. The Giemsa-stained thick blood smears revealed 0.024% Plasmodium parasitaemia (1,200 parasites/μl) with only asexual stages. She was given a three-day course of oral chloroquine (day 1: 600 mg base and 300 mg base six hours later; day 2 and day 3: 300 mg base daily, in total 25 mg base/kg), according to the Malaysian National Antibiotic Guidelines on management of malaria. The patient recovered and was discharged one week later (26 January, 2011). Microscopic examinations of her blood smears were performed weekly for the first month from discharge followed by monthly examinations for one year. All blood smears were negative. The Malaysian Vector Borne Disease Control Programme team did a case investigation among residents within the patient’s housing area and surveyed the area for possible vectors. No other persons were infected and anopheline mosquitoes caught were negative for malaria parasites, as determined by mosquito dissection. In this area Anopheles cracens was the predominant mosquito which is the vector of P. inui and P. cynomolgi. Patient blood samples were sent to the Institute for Medical Research (IMR, Kuala Lumpur, Malaysia) for further species confirmation by microscopy and molecular diagnostic methods. Microscopic re-examination of blood film showed characteristics of P. vivax rather than P. malariae/P. knowlesi, scanty trophozoites, larger than the size of Plasmodium falciparum, were visible in the “ghost” of red blood cells, with large chromatin dot and thick cytoplasm. Molecular species identification was performed by a nested PCR assay based on the small subunit (SSU) rRNA genes with primers specific for P. vivax, P. falciparum, P. malariae, Plasmodium ovale (Snounou-PCR)  and primers specific for P. knowlesi (Singh-PCR) . Molecular diagnosis by the Snounou-PCR assay identified a P. vivax infection yielding the expected size fragment using the specific-primer pair for P. vivax; while the rest of the species-specific nested PCR assays for P. malariae, P. falciparum and the Singh-PCR for P. knowlesi did not produce any amplifications. A DNA sample was sent to the Malaria & Emerging Parasitic Diseases Laboratory (MAPELAB, CNM-ISCIII, Madrid, Spain) as part of an informal quality control exchange. The sample was analysed by a modification of the nested multiplex malaria PCR (NM-PCR), also based on the small subunit (SSU) rRNA genes [28, 29], adding a parallel nested PCR for Plasmodium genus amplification (NG-PCR). The NM-PCR method is able to identify the four human malaria species (P. vivax, P. falciparum, P. ovale and P. malariae) in two consecutive multiplexing amplifications, while the NG-PCR identifies all Plasmodium species. Primer sequences, concentration and annealing temperature to set up these methods are described in Table 1. *First PCR performed at final volume of 50 μl and 5 μl DNA template. †Second multiplex PCR performed at final volume of 25 μl with 2 μl template from first PCR product. ‡Second genus PCR performed at final volume of 50 μl with 2 μl template from first PCR amplification. §Size depending on Plasmodium species: P. malariae 821 bp, P. falciparum 787 bp, P. vivax 783 bp, P. ovale 794 bp, P. knowlesi 807 bp, P. cynomolgi 785 bp. ¶Size depending on Plasmodium species: P. malariae 773 bp, P. falciparum 739 bp, P. vivax 735 bp, P. ovale 746 bp, P. knowlesi 763 bp. P. cynomolgi 738 bp. In the MAPELAB molecular diagnosis by NM-PCR was negative for the four human malaria species and positive for NG-PCR showing an amplified fragment of expected size, confirming that the patient indeed had malaria infection. Sequencing of amplified products, using PLF and UNR primers from the NM-PCR assay, were performed after DNA purification (Illustra DNA and Gel Band Purification Kit, General Electric Healthcare) by Cycle Sequencing using Big Dye Terminator v3.1 in an ABI PRISM® 3700 DNA Analyzer. The sequence obtained has been submitted to the GenBank data base with the accession number JQ794445. A BLAST search of the sequence of 785 nucleotides in GenBank showed highest similarity with P. cynomolgi sequences, 99.9% with P. cynomolgi Mulligan strain from Malaysia (Accession number AB287290), followed by similarities between 99.6 and 99.4% with three other P. cynomolgi SSU rRNA sequences transcribed during the asexual stages (Accession No AB287289, L07559 and L08241), thereby confirming that the patient was infected with P. cynomolgi. Furthermore, a phylogenetic tree was performed, with Treecon software , after ClustalW alignment of the sequences  by Neighbour joining method, comparing the A-type SSU rRNA sequence obtained from the patient with sixty sequences from twelve Plasmodium species. 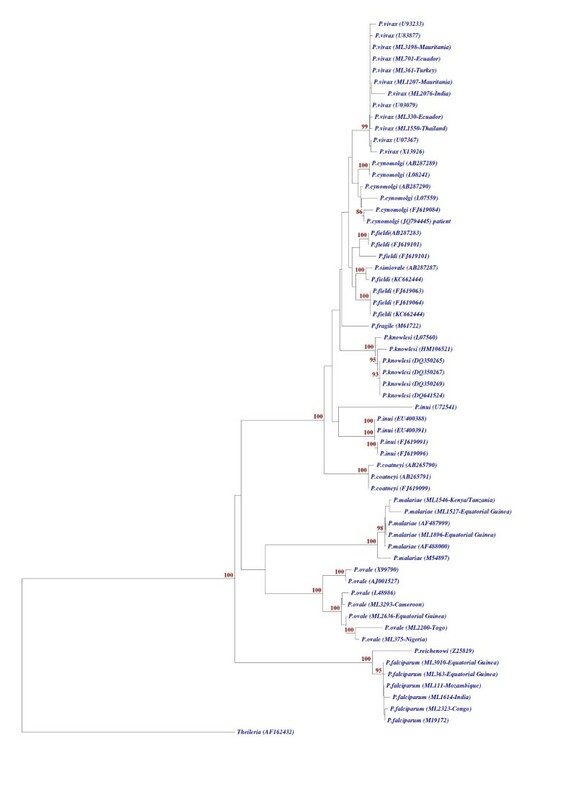 The phylogenetic tree shows that patient’s sequence formed a monophyletic clade with P. cynomolgi independent of the clade formed for P. vivax sequences, adding another evidence that patient was infected with P. cynomolgi (Figure 1). In Madrid’s laboratory, no sample of P. cynomolgi had ever been present, so the result could not be caused by DNA contamination. Neighbour joining phylogenetic tree. Phylogenetic tree comparing the A-type SSU rRNA gene sequence obtained (GenBank accession number JQ794445) with other Plasmodium species identified in our laboratory as well, but not submitted to the GenBank (identified as “ML plus an internal number” given in our Malaria Laboratory followed of the country name in the cases where this is known) and with known Plasmodium A-type SSU rRNA sequences from GenBank (accession numbers are indicated in parenthesis). The sequence of our patient clusters with all other P. cynomolgi strains. Sequence Theileria (AF162432) was used as outgroup. Significative bootstrap values are indicated. Morphologically, microscopic analysis of asexual stages of P. cynomolgi could be misidentified as P. vivax, because they are indistinguishable, and therefore, any infection in humans will be characterized as P. vivax. In these cases, molecular diagnostic methods are the most accurate way to distinguish between species that are morphologically identical such as P. knowlesi/P. malariae or P. vivax/P. cynomolgi[4, 5, 11, 25]. In this study, two different PCR methods gave discrepant results but sequencing showed an infection by P. cynomolgi. NewPLFshort primer coupled to the specific P. vivax primer VIRsh in the NM-PCR did not show any amplification product as it was expected in a P. cynomolgi infection. In contrast, using the rVIV1 and rVIV2 primers, in the Snounou-PCR assay the patient sample was identified as P. vivax showing a possible cross amplification. In the NM-PCR, NewPLFshort primer has 100% identity with P. cynomolgi in the corresponding region, since this primer is designed as a universal Plasmodium primer. Instead, VIRsh primer mismatches six nucleotides out of 15 (40%), including a gap and a double nucleotide insertion, in the corresponding region of the P. cynomolgi sequence (Figure 2). This primer has a melting temperature of 52.7°C and the PCR is performed at very stringent conditions of 53°C. On the other hand, comparing the Snounou primer sequence corresponding to rVIV1 primer with P. cynomolgi sequences, there is only one mismatch in the 30 nucleotides of the primer and the sequence of the rVIV2 primer shows seven mismatches out of 30 nucleotides (23.33%) including two gaps (one of 1 bp, another of 2 bp), most of them localized in the 5’-end primer region and just two in the 3’-end (Figure 2). Furthermore, the melting temperature of these primers is 66.3°C for rVIV1 and 73.2°C for rVIV2 , while the PCR is performed at 58°C [27, 33], therefore a perfect alignment is not necessary and a P. cynomolgi amplification is very possible. The nested PCR assay developed by Snounou and co-workers has been widely used in Southeast Asia in numerous studies with great success, as evidenced by the literature [33–35]. However, based on the experience of this case and according to the primer alignment performed, it is very possible that vivax primers designed (rVIV1-rVIV2) could cross react with P. cynomolgi leading to false positive results for P. vivax. Partial A-type SSU rRNA gene alignment from Plasmodium vivax and Plasmodium cynomolgi in vivax-primers regions. Alignment of partial sequences from Plasmodium vivax and Plasmodium cynomolgi with the Malay case (in blue color and with the GenBank accession number JQ794445) taking as reference the primers VIRsh and rVIV1-rVIV2. Note: The alignment is in forward sense 5’-3’ and the VIVsh and rVIV2 primers sequences are in reverse and complementary form (R&C) to allow the correct alignment. (.) Represents an identical nucleotide. (-) Represents an alignment gap. Malaysia is a country endemic for malaria, particularly in the forested, hilly and underdeveloped interior areas of Malaysian Borneo (Sabah and Sarawak states) and Peninsular Malaysia. There is no risk in urban, suburban or coastal areas, including the east coast where the patient lives. Since the Malaria Eradication Programme started in the states of Sabah and Sarawak in 1961  and in Peninsular Malaysia in 1967, malaria cases have dropped drastically over the years . The major Plasmodium species are P. vivax (70%) and P. falciparum (30%) . In some areas zoonotic malaria cases by P. knowlesi, morphologically indistinguishable from P. malariae, are frequent . The symptoms of the patient were non-specific, she experienced episodes of mild to moderate 24-hour cycles of morning fevers with chills and rigor, cough and cold which mimicked a flu-like syndrome. These clinical symptoms were similar to those described in non-natural infection in humans and were usually present only during febrile episodes. These last experimental infections were performed with laboratory strains, which can be less virulent than natural strains . Although patient experienced fever at 24 hourly intervals, when it was expected every 48 hours, like asexual cycle period of P. cynomolgi, previous reports of infected volunteers with P. cynomolgi showed that fever had different presentations, from afebrile to daily or tertian fever [3, 25]. Despite she lives in a malaria-free area, physicians suspected malaria because the patient experienced the characteristic cyclic fever with chills. A malaria infection by P. malariae/P. knowlesi was the final diagnosis in the hospital and patient was treated with chloroquine, the fever and symptoms resolved and did not show any complications and no relapse at the time of writing this report. Treatment with primaquine to eliminate hypnozoite forms, characteristic of P. vivax and P. cynomolgi, was not prescribed as patient was diagnosed as P. malariae/P. knowlesi. Infections produced in many volunteers by mosquito bite in the 1950s to 1970s with P. cynomolgi sporozoite showed symptoms of moderate severity which were easily controlled by simple medications or even without treatment . In these last volunteers no relapses were described which could indicate that hypnozoites of P. cynomolgi in humans are not activated to become hepatic schizonts, which suggests that a specific treatment with primaquine is not necessary to avoid relapses. This report describes the first known case of naturally acquired P. cynomolgi malaria in humans. Morphologically, P. cynomolgi is indistinguishable from P. vivax, and as shown in this report, one of the most used PCR for malaria infection can characterize those infections as P. vivax. Microscopic examination of peripheral blood by thick and thin film is the golden standard for malaria diagnosis and species identification. Despite the high PCR sensitivity and specificity to detect malaria parasites in the blood, it has not been established as a routine diagnostic method in reference central laboratories to correct misdiagnosis in species identification, as well as increasing sensitivity in cases of individuals with low parasitaemia or asymptomatic carriers. As shown in this report and others, misdiagnosis in species identification can be more frequent than expected, especially in relation to non-human malaria, such as P. knowlesi or P. cynomolgi[4–6, 25], as well as human infections involving P. vivax, P. falciparum and P. knowlesi. Simian Plasmodium species could routinely infect humans in Southeast Asia and the correct diagnosis could be missed since it is not possible by microscopy to accurately identify Plasmodium species with similar morphology, such as that observed between P. cynomolgi and P. vivax. The application of new diagnostic methods is necessary to distinguish between the human and monkey malaria species. Further epidemiological studies, incriminating the mosquito vector(s), must be performed to know the relevance of cynomolgi malaria and its implication on human public health and in the control of human malaria. The importance of zoonotic malaria transmissible by non-human primates cannot be ignored in view of increasing interactions between humans and the wild animals in the process of urbanization. Oral and written informed consent was obtained from the patient for publication of this case report and any accompanying images after explanation of the report objectives. Small subunit ribosomal ribonucleic acid. We gratefully acknowledge the patient for allowing us to publish her case. The authors would like to thank the Director General of Health Malaysia for his permission to publish this paper. We thank the Director for the Institute for Medical Research (IMR) Kuala Lumpur, for her review and support in publishing this paper. We gratefully acknowledge Dr Balbir Singh, University Malaysia Sarawak for helpful reviews and valuable suggestions. This work was supported by the Interuniversity Cooperation Programme (AECID grant and A1/035539/11) and IMR/NIH Project NMRR-11-410-9622. THT was financed by a fellowship from the Instituto de Salud Carlos III. JMR supervised molecular characterization of parasite, conceived the study, its design and coordination, analysed the data and corrected the manuscript. THT carried out the molecular methods (NM-PCR and NG-PCR), analysed the sequence alignment, the data and drafted the manuscript. SH participated in the design and coordination of the study, and drafted the manuscript. AIJ and NI performed the patient DNA isolation, stained and examined the slides by microscopy and carried out the molecular methods (Snounou-PCR and Singh-PCR assays). ML was the responsible the sequencing and archive blood sample. All authors read and approved the final manuscript.